This tour is an absolute must for nature lovers. It takes you Crete's second natural lake near Agia, a bird paradise all year round. You will cross Crete's 'Orange Valley', with thousands of orange trees, and visit the largest botanical garden on the island, where the restaurant will delight passionate vegetarians in particular. Experience a wonderfully beautiful gorge from the comfort of your car, and stop over in a mountain village on your way, which is of particular importance in recent Greek history. 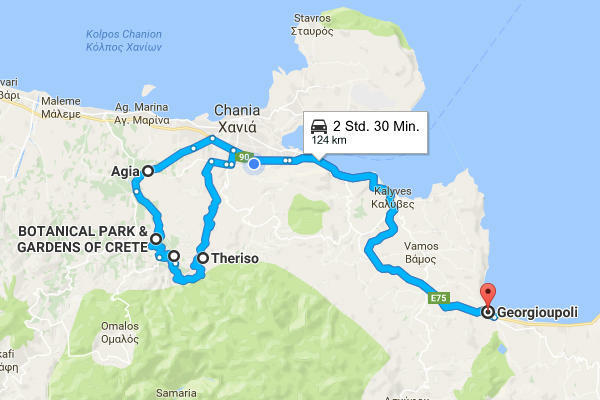 From Georgioupolis the National Road takes you past Aptera and Chania to an exit marked as 'Omalos' and/or 'Sougia'. Of all the things to drive past, in the town of Oassis you will see the prison of western Crete on the left-hand side, a large white building with an extensive flower bed bordering the street. Just after that, a large green sign marks the "Lake Café" to the right of the road. Follow the sign to Lake Agia. Lake Agia is much smaller than Lake Kournas and lies in flat surroundings, but it is beautiful in its own right. Its shores are lined by a thick layer of reeds; the footpath does not lead around the whole lake. But from the Lake Café, you can take a well maintained path along the shore to the little wood opposite, beside which Agios Konstantinos church looks almost Tuscan with its red tiled roof, small bell tower and arched windows. The café is particularly well suited to families with children, offering a lovely lawn area and even a small, basic football ground. The terrace is a wonderful place to watch herons, ducks and geese; numerous songbirds flit past overhead. At the Lake Café you will already drive past the first large orange plantation. You are now entering the Orange Valley of Crete. The villages here are also known as Portokalochoria, or orange villages. If you follow the Greek sign to 'Agyia' you will come back onto the main road. Follow it towards Omalos. The Botanical Park is already signposted here. Before you get there, you will pass through the village of Fournes, with two packing stations for the orange harvest. The farmers haven't had much joy in recent years, because at times they only receive 10 cent per kilo for oranges. However, they continue to cultivate them, and in Fournes you will even see them between every house in the village. The main harvest takes place between December and April; there is a second harvest time for another kind of orange in May and June. High above Fournes, the Botanical Park of Crete awaits you to the right of the road to Omalos. You should plan to spend at least 90 minutes here, and nature lovers will definitely need even longer. Barely 60 km from Georgioupolis, the first Botanical Park in Crete has been developed above the Cretan 'Orange Valley' in the last ten years. On 20 hectares of land, over 150 different kinds of fruit trees from all over the world, herbs and medicinal plants, flowers and blossoming shrubs flourish here. Plants from three different climate zones thrive here, including many tropical, as well as Cretan blooms. Signs in Greek, English and Latin give their names. The circuit of the park is 2 km with 1 km of side trails guiding you through this unique paradise, which you can enter daily between 9 am and 75 minutes before sunset. The Botanical Park is a private endeavour. It belongs to a family from the nearby village of Skordalou. Until October 2004, almost 60,000 olive trees thrived here. Then an electricity pylon fell during a southern storm, and started a fire that destroyed all of the trees within 24 hours. One of the family's four sons had the idea of using the burned area as the grounds of a park. His three brothers and parents were happy to be involved. Crete is blessed with a climate that ensured that the idea could quickly become reality. Today, the park receives approximately 35,000 visitors annually, with more coming every year. Besides the family that owns the park, 15 men and women have found employment here. You should plan at least two hours for the circuit of the park, where ducks, geese, peacocks, livestock and numerous wild animals also live. Afterwards, the unusual park restaurant awaits you. Here they use almost exclusively produce from the park, so there is no apple or pear juice here, because this kind of fruit doesn't grow in the park. Instead guests are served seasonal fruit juice made of freshly harvested Mediterranean and tropical fruits. Cretan dishes receive a special touch with the addition of limes and lemongrass grown in the park. The homemade lemonade is refined with mint. Bread comes from their own wood-burning stove, and the meat for the few non-vegetarian dishes comes from stock breeders in the surrounding area. Those who don't mind driving in the dark and returning later to Georgioupolis can experience an authentic Cretan evening here every Monday from 7 pm. After a mostly vegetarian buffet, guests head down to the small amphitheatre in the park, where 12-15 dancers from the surrounding villages perform authentic Cretan folk dances. They are accompanied by three musicians playing the lyre, the laouto and the mandolin. A fourth musician plays the Cretan bagpipes, the Askomandoura, which are otherwise rarely heard on the island. After what is certain to have been a wonderful time in the Botanical Park, drive back to Fournes and then turn right towards Meskla, which is 5 km away through a luscious, green river valley. The village itself isn't anything to write home about, but it impresses with its wonderful location. That's why people have also started to replace the trees on the hillsides here with villas. Shortly after entering the village, a brown sign points to the 'Church of Christ Savior' 50 m away. Its doors are always open. In the narthex, or vestibule, you are able to make out the vestiges of a depiction of the Last Judgement; in the first niche on the right wall of the church itself there's a relatively complete depiction of the Metamorphoses or Transfiguration of Christ on Mount Tabor (both wall paintings date back to the 14th century). Much more impressive, however, is the sight of the church of the Virgin Mary on the way out of town. It is large, but appears delicate, like a plaything. It was built onto an old church of the Virgin from the 14th century (both are open every once in a while). A powerful spring gushes forth here, which naturally has its own taverna. After Meskla, the road rises sharply, passes by two panoramic tavernas and reaches the village of Zourva, 570 m above sea level. An excellent tarmac road takes you on past slopes full of oleander, until 7 km after Zourva the road reaches Therisso. Here, you can spend half an hour following in the footsteps of recent Cretan history. This mountain village with only about 100 inhabitants is something like the birthplace of modern Crete, and besides Arkadi Monastery it is the second 'National Sanctuary' on the island. In 1898 the Cretans had finally thrown off the yoke of Turkish foreign rule; however, the Great Powers of Russia, England and France didn't want to permit the island's annexation to Greece right away, which had already been liberated. They declared the island an autonomous part of the Ottoman Empire, whose nominal head of state remained the Turkish sultan. As regent, they inaugurated the Greek Crown Prince, Georgios, after whom our village of Georgioupolis was named. Georgios proved to be weak, however, and submitted to the interests of the foreign Great Powers again and again, who operated powerful consulates in Chania. That's why the Cretan politician Eleftherios Venizelos, who was born in the nearby village of Mournies in 1864, called for a rebellion. Under his leadership, the declaration of revolution was drawn up in Therisso in 1905, which called for resistance against the tyranny of the Great Powers and the Crown Prince of Greece whom they had appointed. This rebellion, led from Therisso, brought about the abdication of the Crown Prince. Despite the rebellion, it took another eight years for Crete to be finally annexed to Greece. That only happened in 1913. Eleftherios Venizelos experienced it as the Greek Prime Minister, an office which he held from 1910-1920 for the first time. After years of exile in Paris, he ruled the country again from 1928-1933. In 1936 he died in Paris. In the village centre, the house that once served as the headquarters of Venizelos and his rebels is now a small museum, showcasing photographs, documents and weapons from the years of the rebellion. A second museum diagonally opposite commemorates Cretan resistance to German troops in the Second World War. Of course, there is also a monument to Eleftherios Venizelos on the village square, in front of the small, very plain double church of Agias Ekaterinis & Panagias. Indeed, the ten (yes, ten) tavernas right on the main square are much better frequented than the church. They live from Cretan school trips and locals out for a drive on a Sunday. Shortly after leaving Therisso, the Therissiano Gorge begins. It's approximately 6 km long and winding. During the Ottoman occupation, many battles were fought here between Cretan freedom fighters and the Sultan's troops. Even habitual drivers can enjoy the thrill of Cretan gorges here at their leisure. The road then leads through Mournies, with the birthplace of Eleftherios Venizelos, and reaches the National Road, taking you back to Georgioupolis.